Disconnect power first. 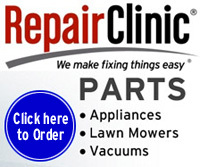 In order to test and effect repairs on any product, you must be able to disassemble and reassemble the appliance. So lets start with disassembly on this dryer. Unplug the dryer. Get the top up by pushing in on 2 clips on either side as shown in this picture. We need to remove the front of the dryer next. There are 2 or 4 screws inside at the top on most of the older dryers that we need to remove. 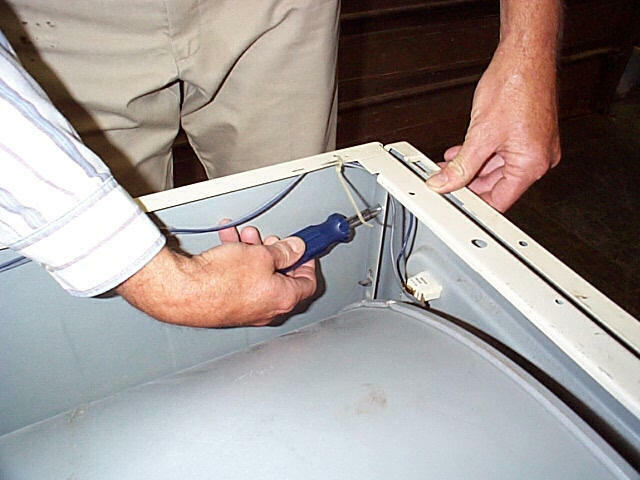 Once the screws are removed, you can pull forward on the front and lift the complete front off the 2 clips on the bottom of the dryer. 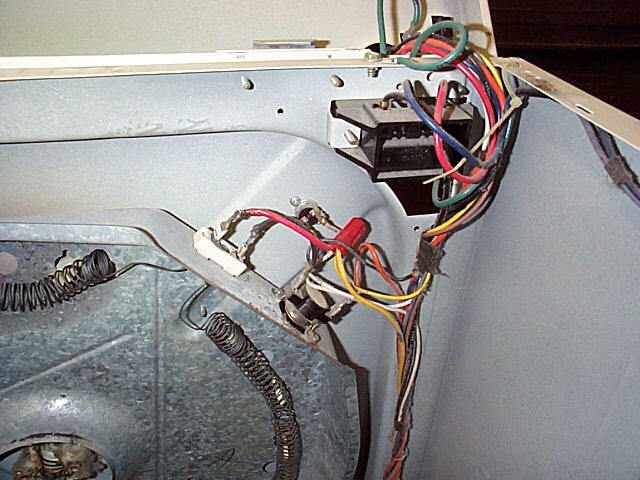 Unplug the door switch wires and set the front aside. Next step in disassembly is to remove the belt from the idler and the motor pulley. This is done at the rear of the dryer. Remove the 2 screws holding the inspection plate on the left rear of the dryer. Remove the plate. 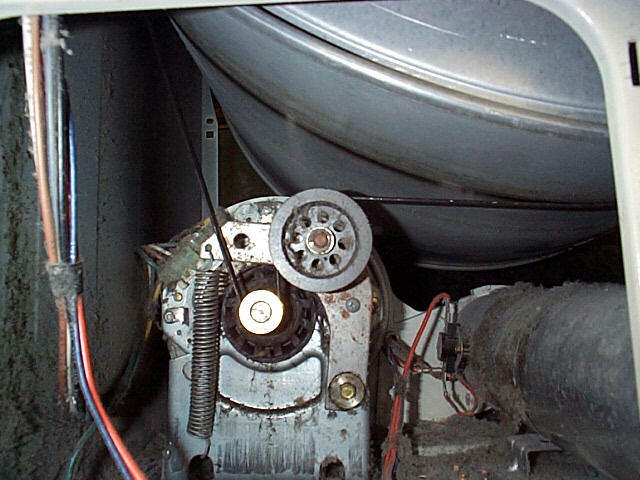 Look carefully at how the belt threads around the motor pulley and idler pulley so you can replace it. Remove the belt from the motor pulley. 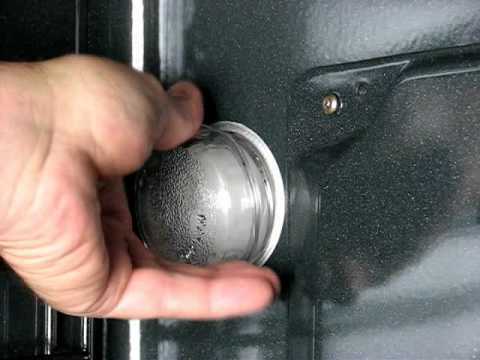 Return to the front of the dryer, grasp the belt in one hand and the front of the drum in the other hand. Lift up on the rear of the drum and pull forward with the other hand. 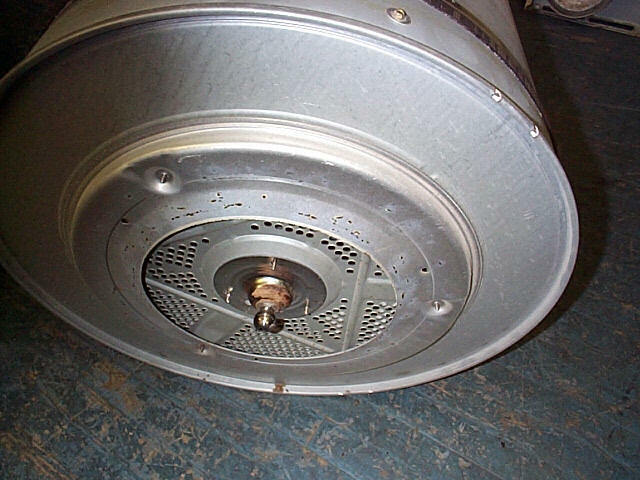 There is a ball on the rear of the drum that rides in a socket located in the center of the back of the dryer. You are lifting the knob up and out of the socket. Look in the center of this picture for the socket. You have taken the dryer far enough apart at this point so that you can accomplish any repairs needed on this style dryer. It is not necessary to go this far for all repairs, but if you need to disassemble, you have the information. Remove and discard the existing top felt seal ( spacer ) and separate glides if used. Clean the surface of the arc, removing all residue of the old felt. Scrap it off clean with a putty knife or flat screwdriver. Apply the adhesive ( usually furnished with the glide kit ) to the arc. Attach the new felt/glides assembly to the arc in line with the gray/white lower seal. NOTE: about 1/8" of the felt will extend over the lip of the arc. Inspect the drum lip ( bearing/glide surface ) for wear. It must be smooth. 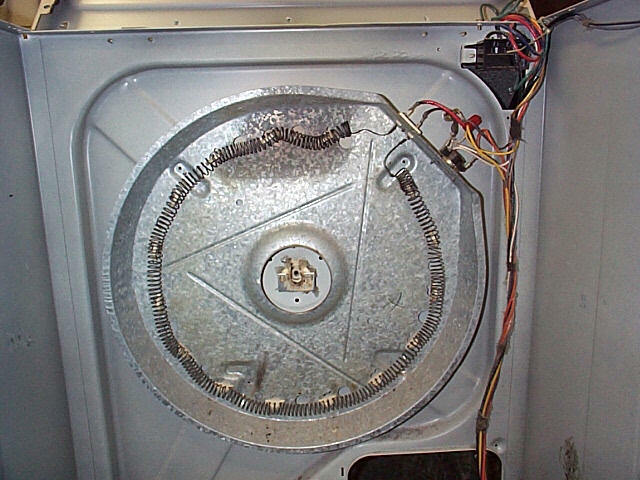 Reattach the front panel to the dryer and connect the related wiring. 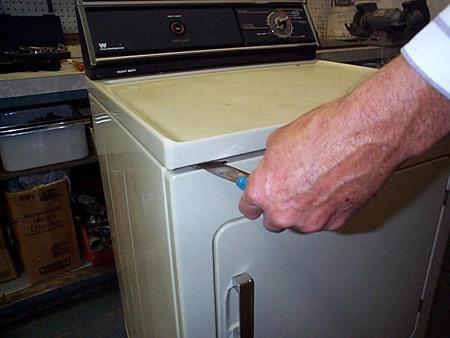 Reconnect the dryer to the power supply and test to ensure proper operation.